A versatile performer that you won't need to take a second mortgage out for. We'd prefer an understated finish. The Jazz and Blues Series is quite a departure for Alvarez. The Tobacco Sunburst finish instantly recalls those old Gibsons, but we can't help wondering how much cooler it would look in an understated matt finish instead of the thick high-gloss here. The overall build is tidy and solid, but with some interesting diversions from the Alvarez norm. Instead of the firm's trademark bi-level bridge, we get a retro rectangular rosewood design. In keeping with the less is more vibe, fret markers are on the top side only, though Alvarez's tribal-esque 12th fret marker is a jarring break from the old-school; contrasting with the more in-theme headstock logo and open-gear tuners. Picking it up, we get to grips with the feature that is probably going to divide many players. The deep V-shaped neck with wide string spacing (5.8 inches), is either an acquired taste or a total deal-breaker depending on your tastes. But this is part of the core character of vintage 30s parlour styles, and the open-minded will soon get the point - especially as the smaller body allows it to sit closer to the player. It encourages the kind of bluesy digging in with a pick that this guitar is all about. These high-mid-voiced acoustic shapes can sometimes border on the nasal - that's the appeal for some - but the Delta's tonality is a little more open in its compression when strummed. The note definition for fingerpicked blues is impressive, too, and feels in equilibrium with the neck and string spacing, especially if your hands are on the larger side. Though you won't find the deeper bottom-end of dreads and jumbos here, the bass notes add punch without feeling muted. As we tune down half a step, that presence is enhanced further, and we're pleased to report the tension holds up well. The plugged-in performance with the LR Baggs Element VTC is strong, enhancing the bass presence and placing the Delta in a more versatile territory than we imaged. The subtly placed volume and tone controls placed inside the soundhole don't break with the vintage aesthetic either. 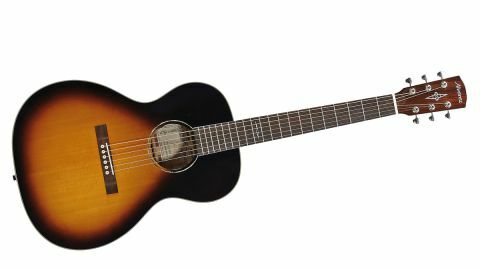 The Delta is an acoustic that is more versatile than its name and looks suggest. There's an intimacy to its charms that could make it an inspiring instrument for singer-songwriters and fingerpickers, with a plugged-in performance that is ready for the road.